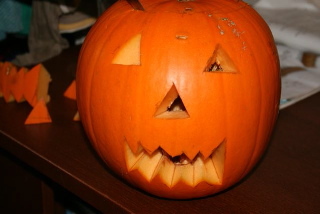 ….The Jackolantern is still sitting in the window, there are still tiny black plastic spiders all over the house, pictures of pumpkins still adorn the walls and the house gets decorated for halloween everday…..Why? Well it’s our first time! ….Halloween is not a big deal in Australia, It comes and goes, almost unnoticed except for ‘The Simpsons’ halloween specials, or re-runs of cult horror flicks. It is coming though, with our immersion in American mass media, dressing up Halloween parties and ‘trick or treating’ are certainly gaining popularity. I actually thought Halloween only really happened in America. I thought it would pass unnoticed for us yet again. But then a couple of months ago the supermarkets started to fill up with costumes. 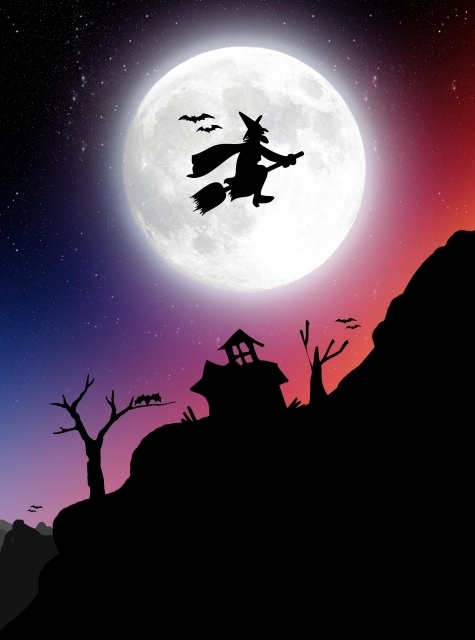 Everthing from witches to princesses, ghosts to dracula arrived and immediately started to fly off the shelves. Add the ‘Halloween Tent’, with it’s display of singing pumpkins (I want candy) coffin shaped drinks coolers, spiders webs, and ‘carving’ pumpkins and I’m starting to get it. The charity shops follow soon after. They must save all the constumes they’ll be getting now, until next Sept/Oct. 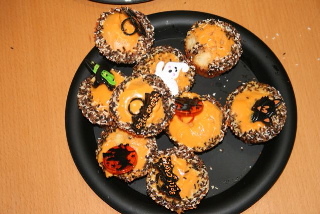 We’re invited to a halloween party, and the next thing I know, we’ve bought costumes (D is very excited about being a ghost) purchased our pumpkin and ordered our ‘scary cupcakes’ to take to the party! This is all getting very fun. 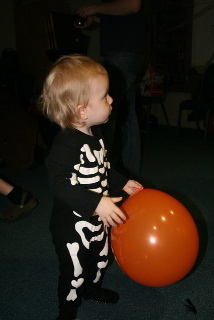 People are also talking, Nursery parents comparing the way Halloween was for them as children compared to how it is now. Trick or Treating was known as Guising (as in disguising) and children would dress in disguise walking from neighbour to neighbour performing songs, poems or jokes for their treat. Costumes were rustled up at home, not purchased from a store. It was these conversations that made me realize that the celebration of Halloween is steeped in history, mystery and intrigue. It is linked with the Celtic Harvest Festival of ‘Samhain’ (sow-in) roughly translated as summers end. In the Northern hemisphere it traditionally marks the end of the light time and the beginning of the dark time. It was thought that the veil between worlds became thin on All Hallows, allowing spirits both good and bad to cross over. Harmless ones (often family members) were welcomed and invited in while the harmful ones were warded off. 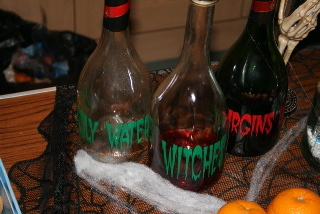 The costumes were worn as protection from these spirits. Young men would diguise themselves as harmful spirits to avoid being harmed. 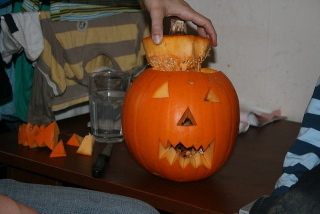 Traditionally in Celtic halloween festivals, large turnips were carved into lanterns and placed in windows to (you guessed it) ward off more evil sprits. 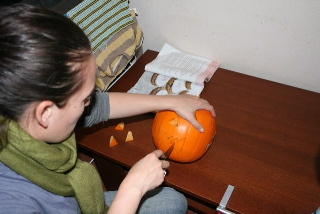 First things first, Pumpkin Carving. 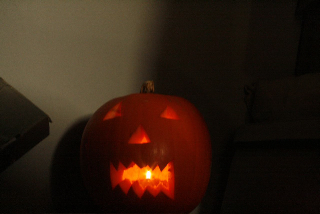 We then had to turn all the lights off, light the lantern and run around the house scaring each other. 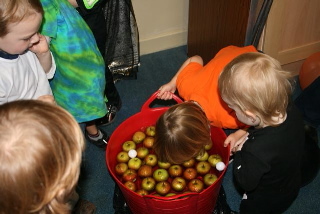 Dressing up was definitely a must…..
Bobbing for apples was an all important task. Apple bobbing was traditionally a form of divination as the first person who got hold of one was thought to be the first to marry. The only thing we didn’t do is ‘Trick or Treat’, although I did expect some people to our door, my boys were a little too tired and a little too little. 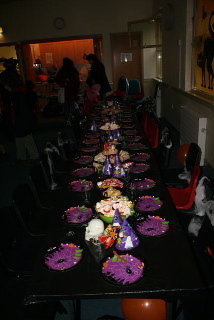 We were content with our Nursery Halloween party, sitting together around a big table drinking blood (red cordial) and eating scary cupcakes, severed finger biscuits and lots of sweeties (the empty seats are for the friendly spirits invited in for tea ;)). We also had music, dancing and games! he Nightmare before Christmas’ and still finding little black spiders all over the house!! 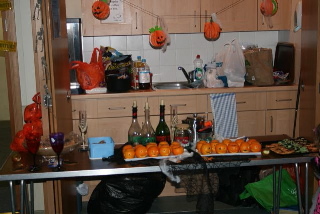 This entry was posted in Events and tagged Halloween. Bookmark the permalink.